A hot topic in my hometown of Rochester recently is what to do with the remains of our subway system. A little background… Rochester is one of the smallest cities (if not THE smallest) to ever have a subway. While operations stopped in 1956, part of the structure that runs beneath downtown still remains under the Rundel Library before turning west across the Genesee River. The two photos below show the structure which resides under Broad Street as it crosses the river. This structure was reopened to the public years ago, and has become a sort of creative freespace. Graffiti artists and photographers have a field day in this unique location, with sun pouring in through the arched “windows.” I myself have done several portrait shoot in the subway tunnel, as it is the sort of unregulated space with excellent natural lighting and a colorful backdrop that we photographers crave. The controversy lies in a recent Rochester riverside development project that will seal off the main entrance to the subway tunnel. While there will still be other ways inside, the project will infringe on a section of this historic structure, causing many who appreciate this space to wonder if this is the beginning of the end for one of the most unique pieces of Rochester’s structural history. 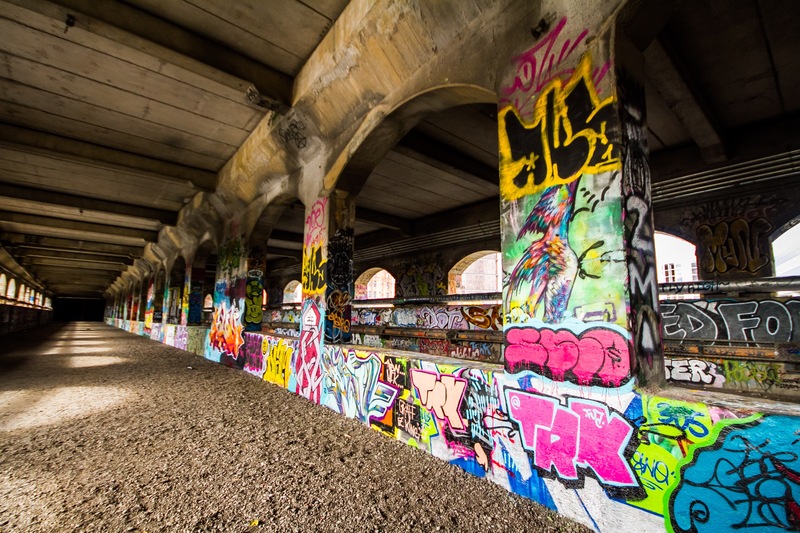 The debate seems to have two sides, those that want to keep this environment free and open to street and graffiti artists, and those who believe that Rochester needs to move forward and continue development of the waterfront. I will throw in a seldom-heard third opinion that has been gaining some momentum but is still a long way off. The Rochester City Subway structure, especially the piece that runs across the Genesee river could itself be repurposed and developed (while preserving the historical structure) to commercial, restaurant or even recreational hotspot that very few other cities in the world have! Imagine eating dinner in a high end restaurant that straddles the Genesee River at night? Imagine walking or biking along Rochester’s underground answer to the High Line Park in New York City? Imagine a shopping, museum or cultural experience in a unique space that no city to my knowledge in all of New York State has? The truth is the designs for all these things are there. 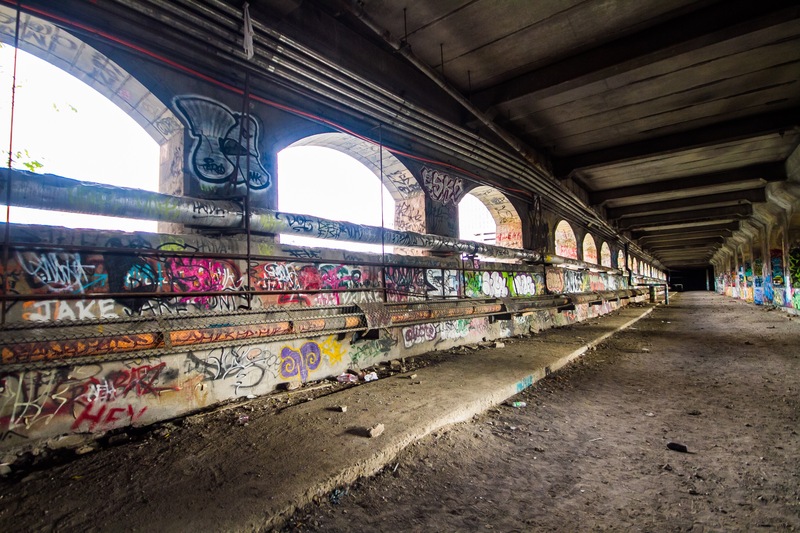 Many developers over the years have devised some very attractive preliminary plans for the use of the subway remains while still preserving its historical significance, but all of them would be very expensive to execute, and all of them are likely 6-10 years away. To me, Rochester needs something unique, a sort of “cherry on top” to usher a suburban-driven community back downtown, as well as encourage tourism from neighboring cities. The subway structure over the Genesee river could be that draw. To those who believe the subway should remain an untouched area for artists, I understand and very much appreciate your desire as an artist myself. I do however believe that the subway is too valuable a resource to the future of our city to simply let it be, as much as it pains me to say so. To those who want to forget about the subway and fill it in, or develop the area such that further use of the subway tunnels are impossible, I remind you of the disaster that urban renewal brought upon our cities, crushing history and the possibility of wonders of repurposing as it moved along. Let’s look at a third alternative and turn this into a space that everyone can enjoy, that ushers people to downtown once again while maintaining the historic significance of this key piece of Rochester’s history. I truly believe that the structure that ran through the heart of our city can be the spark that gets that heart beating again.